Today’s cinema adventure: Freaks, the infamous 1932 film by director Tod Browning, about- and starring- the disfigured performers of a circus sideshow; controversial from the moment of its release and still disturbing today, it was lambasted by critics who found it repugnant, and was quickly pulled from circulation after provoking public shock and moral outrage. Considered an affront to decency, it was barred from exhibition in many U.S. states and in countries around the world, and effectively ended the career of a director who had been one of Hollywood’s most respected talents; nevertheless, over the ensuing decades it gained a reputation- no doubt enhanced by its lack of ready availability- and became, in the ’60s and ’70s, a cult favorite, frequently screened as a midnight movie despite the fact that many of the prohibitions against it were still in place, making it technically illegal to be shown in many states. Its rediscovery led to a critical re-evaluation, and today (thanks to modern society’s more enlightened, less reactionary view of its subject matter) it is widely regarded as a genuine classic, a brave and truly unique piece of filmmaking and a seminal influence within the horror genre. The story takes place entirely within the insular world of a traveling circus, focusing on the day-to-day existence and relationships of its cast- particularly the collection of malformed misfits that comprises its sideshow, which includes dwarfs and midgets, “pinheads,” conjoined twins, a legless boy, a human torso, and numerous other bizarrely-shaped and differently-abled individuals who, despite their deformities, enjoy a comfortable and seemingly pleasant existence within the rarified environment of the circus, living together in a tightly-knit community with its own sort of exclusivity- as well as its own unwritten code that governs their interaction with the outside world. One of their number, a midget named Hans (who has recently become engaged to Frieda, another little person in the troupe), has become obsessed with the “normal” Cleopatra, the show’s new trapeze artist, an exotic beauty who indulges his attentions with flirtation and flattery; privately, however, she is only amused by his affections, making cruel fun of him with her real lover, the circus’ opportunistic strongman, Hercules. Though warned by his fellow “freaks” that she is not sincere, Hans continues to pursue Cleopatra, eventually spurning his fiancée for her; she humors him in order to take advantage of the lavish gifts he gives her, and when she discovers that he is secretly the heir to an enormous fortune, she and Hercules decide to steal it for themselves. She concocts a plan to marry the little man so that she can become his beneficiary, and then slowly poison him, making his death seem due to illness and allowing her to claim the money and run away with the strongman. At their wedding feast, however, she becomes drunk, reacting with disgust when the freaks attempt to accept her as one their own and inadvertently revealing her affair with Hercules. Though she is seemingly able to allay the suspicions of her new husband- who has grown weak from the poison she has already begun to administer- the other sideshow performers are onto her scheme, and they resolve to take matters- and justice- into their own hands. Director Tod Browning had spent his early youth in the circus (which he had run away from his privileged family to join) where he had formed a strong connection to the specialized society of its inhabitants; when he encountered the short story, Spurs, by Tod Robbins, he immediately knew he wanted to use it as the basis for a film. He had built an impressive career as a director of silent films, making a name for himself through his extensive collaboration with renowned horror star Lon Chaney, with whom he created a number of classic films known for not only their moody eeriness, but for their remarkable level of humanity; after continuing his success into the sound era (as the director of Dracula, the 1931 hit which made a star of Bela Lugosi), he was able to convince MGM Studios- with whom he had worked on the Chaney films- to allow him to develop a film based on Robbins’ story. Though the studio had serious reservations, production head Irving Thalberg gave Browning his full support, even in his decision to use real sideshow performers in the film instead of actors in makeup. Consequently, working from a screenplay that combined basic elements from the original story with the concocted plot of Cleopatra’s treachery, as well as episodes inspired by his own experiences in the circus, Browning was able to realize his dream project. In the end, he may have wished he had not; his use of genuinely deformed actors caused an outcry from public and critics alike, who felt their presence made the film far too disturbing to watch. Worse yet, Browning was accused of exploiting these unfortunates for his own profit, much in the way that real-life carnivals and sideshows had done for years. Whether or not this was true, the film’s preview screenings were a disaster, with audience response so vehemently negative- and one female patron threatening to sue MGM over a miscarriage supposedly brought on by the movie- that the studio edited out 30 minutes of the most upsetting footage before its general release, leaving it with a running time scarcely over an hour. Even with these cuts, a new prologue, and a more upbeat happy ending tacked on for good measure, Freaks was a failure at the box office; not only did it fail to make back its cost, it generated so much negative publicity for the studio that, after a short release, they pulled it from theaters and put it on the shelf- though it would later emerge in exploitative road show tours, under lurid-sounding titles such as Forbidden Love and Nature’s Mistakes, and sometimes accompanied by such titillating underground fare as amateur films of nudist camps. As for Browning, he was more or less blacklisted from making any more important movies, relegated to helming a few low-grade horror entries until he gave up his career in 1939, and he passed away in relative obscurity in 1962- just a few years before the resurgence of interest in classic horror films that would doubtless have restored his fame and reputation, never to see the day when a youthful counterculture would turn his greatest failure into his greatest triumph. Calling Freaks a triumph, actually, might not be an apt description; it possesses a raw and unfinished quality that has nothing to do with the removal of so much footage (all of which is now, sadly, considered lost). Its story is sensationalistic, more a transposition of conventional melodrama into an unfamiliar setting than a real attempt at exploring this rarely-seen world, and it capitalizes on the irrational fears of the lowest common denominator to achieve its horrific effect. Despite these things, however, and perhaps even because of them, it has a unique power that makes it nearly as shocking today as it was 80 years ago; watching it is as difficult as it is fascinating, evoking a decided sense of seeing something you’re not supposed to see. It’s actually very easy to understand why audiences in 1932 would react so violently to Browning’s film, unaccustomed as they were to the kind of distorted imagery of the human body that has since been portrayed onscreen. Even today, thanks to advances in medical and nutritional science and the ready availability of pre-natal care which have made such dramatic and heartbreaking birth defects a much rarer occurrence, the sight of all these non-CG-enhanced distortions of physical humanity is more than a little unsettling. The real power of Freaks, though, is only apparent for those who can get past the deliberate gross-out factor of its surface and invest themselves in its story, the clear message of which is that true ugliness lies not in physical appearance but in the soul. Without exception, the so-called freaks are good-natured, trusting, generous and sweet (though Hans may be blinded by desire into making some foolish choices); it is the “normals” who are the real monsters here, with Cleopatra’s gold-digging cruelty and Hercules’ brutish arrogance making them truly among the most loathsome villains in classic cinema. Of course, it would be contrary to Browning’s message to make all of the normal characters so unpleasant; the others exhibit varying degrees of likability, in terms of their relation to the freaks, from the uncharitable but relatively benign attitudes of the circus’ tumblers (a decidedly non-athletic-looking pair, incidentally, to be holding such a job) to the kindness and total acceptance offered by the film’s ostensible romantic leads, the lovely seal-trainer Venus and her clown boyfriend Phrozo, who even risk their own safety to come to the aid of their oddly-shaped friends. Though the narrative approach is simplistic and heavy-handed, the black-and-white morality is part of what makes it work; it should be obvious that true humanity exists under the skin, having nothing to do either with physical beauty or the lack of it, and it is one of the defining characteristics of the insensitive and the mean-spirited that they neither see nor care about this basic truth- they are, in fact, the real “freaks” in this story, the unnatural evil that must be weeded out in order to restore harmony. It is a testament to Browning that he makes their comeuppance both horrific and immensely satisfying, accomplishing the somewhat Hitchcockian feat of transferring audience identification to the perpetrators of violence in order to underscore his subversive point. Freaks does not dwell entirely in the dark and moralistic realm of its main plotline; throughout the film are vignettes, many of them drawn from Browning’s real-life memories of his own years in the circus, of existence in the sideshow world. It’s a place where, despite the extraordinary nature if its inhabitants, the details of daily life are mundanely familiar- Frieda the midget having girl talk with Venus while hanging laundry, lovers’ politics between the conjoined twins and their paramours (both of whom are, by the way, normals), the joyful bedside gathering of friends when the bearded lady gives birth- and go a long way towards endearing us to the misshapen cast of characters. Some of these moments are played for laughs hinging on the idea of these outwardly strange individuals behaving like average people (a conceit which, though likely very true to real life, was also a staple of the sideshow and vaudeville acts in which they performed); others are touching and revelatory, such as the early scene in which a landowner stumbles upon Madame Tetralini, the sideshow’s “headmistress,” accompanying several of her more drastically deformed charges on an outing in the woods. A few of these sequences awaken a genuine sense of wonder and open a window into these unusual lives, such as the famous scene when Prince Randian, the “Human Torso,” expertly lights a cigarette using only his mouth or, most particularly, when a passionate kiss bestowed on one of the conjoined sisters sends a tingling wave of arousal through her twin. These humanizing moments, some of them unforgettable, contribute to the effects of the well-known scene of Hans and Cleo’s wedding feast; we feel the infectious joy of their raucous celebration- sharing in the fun of Koo-Koo the Bird Girl dancing on the table rather than experiencing the appalled reaction of an uninitiated gawker, respecting the true generosity of their chanted ritual of acceptance for the new bride (“Gooble-gobble, Gooble-gobble, One of Us, One of Us!”) instead of cringing at its seemingly ominous implications, and recognizing Cleopatra and Hercules’ drunkenly flagrant contempt and disrespect for their hosts as the deep affront that it is rather than identifying with it. For the film’s harrowing climax, however, though these efforts to bond us with the freak community may allow us to be on their side, our sympathy does nothing to alleviate the sheer visceral terror they evoke when we see them lurking in the shadows or crawling slowly but inexorably towards their helpless quarry. This is Browning’s true mastery coming to its fruition- he helps us to subdue our instinctive and primordial fears around these outwardly disturbing figures and then brings those fears to life for us in a way which simultaneously repulses and elates us. In this way, he offers a film which transcends its own morality to deliver a pure, non-intellectualized reaction, and one which has rarely been matched, let alone surpassed. As disquieting as this famous climactic sequence may be, modern audiences will only be able to imagine what it was once like. Following the film’s overwhelming rejection by preview audiences, MGM made Browning cut a large portion of it; the original version featured the brutal castration of Hercules and included a lengthy and graphic mutilation of Cleopatra by the vengeful freaks. There was also a longer version of the sideshow epilogue, in which the former strongman was seen on display, singing soprano, before the final revelation of the once-beautiful Cleopatra transformed into a grotesque duck woman- webbed feet, feathers and all. This latter image, of course, remains in the film, no less disturbing for its lack of logical explanation, and justly infamous for its sheer audacious shock value. It was meant to be the final moment, a lingering horror to send the audience home to their personal nightmares; in most existing prints of the movie, however, it is followed by a short finale- hurriedly filmed after the cuts were made, in hopes of leaving audiences on a more hopeful note- which shows the reconciliation of little Hans and his faithful Frieda, a pleasant enough conclusion, but juxtaposed against what we have just witnessed, one that feels a little hollow. In terms of its production values, Freaks was a fairly high-budget project, and it shows. Many of its scenes were shot on location (that is to say, outdoors) giving it an expansive, realistic feel that is missing in many of the more set-bound films of this early talkie period. The cinematography (by Merritt B. Gerstad) is a masterpiece of chiaroscuro black-and-white moodiness, and the artistic design captures the authenticity of its circus setting in all its rough-edged, seedy glamour. As for the acting, the “normal” cast all deliver perfectly acceptable performances in the somewhat stagy, melodramatic style of the day, with Olga Baclanova appropriately standing out as the flamboyantly callous and deceitful Cleopatra. The specialty players, though all were seasoned performers in the real-life sideshow and vaudeville circuit, were not trained actors; even so- though their delivery is sometimes stilted, their diction often indecipherable, and their characterizations generally simplistic- they are so genuinely themselves that they win us over with the power of sheer personality. This is especially true in the case of some of the more profoundly compromised actors, such as the microcephalics (“pinheads” being the less-sensitive but more commonly-known term)- particularly “Schlitzie,” (in real life, despite the dress, a man named Simon Metz), whose infectious charm practically leaps off the screen- and those others affected by especially severe genetic defects. Also memorable are Johnny Eck (the legless boy, a handsome and particularly gifted performer who was well-known and popular in Vaudeville), the aforementioned Prince Randian, and Violet and Daisy Hilton (the Siamese twins, also well-established as entertainers offscreen and later the subject of two stage musicals and an acclaimed documentary). In many cases, these performers continued to work and thrive for many years after their appearance in Freaks (though with the decline of vaudeville many of them eventually faded into obscurity); indeed, one of the movie’s prominent dwarfs, Angelo Rossitto, went on to enjoy a long career as a film actor, culminating in his appearance as the key character of “Masterblaster” (or, at least, the “Master” half) in the 1985 action/sci-fi fantasy, Mad Max Beyond Thunderdome. For most casual audiences, the most important question is this: does Freaks live up to its reputation? My answer is an enthusiastic “Yes!” Truncated and brightened-up as it may be, Freaks is still a powerful film experience, one which achieves the rare objective of truly forcing the audience to confront its own level of humanity. It’s hard not to feel compassion for these examples of nature gone wrong, but Browning’s film makes it clear that it is not our pity that matters- rather it is our acceptance. Pity is another form of judgment, after all, no different perhaps than the less charitable attitude of dismissive contempt exhibited by the film’s scheming villains; it is based on a presumption of inferiority, and even of powerlessness- a presumption Cleopatra and Hercules, to their misfortune, discover to be very much mistaken. Browning’s movie, for all its deliberate creepiness and sensationalism, is ultimately a powerful reminder of the old admonishment not to judge anything- or anyone- by appearances, and more than that, a strong plea for tolerance and equality. The circus, after all, is a classic metaphor for the world itself, and the sideshow freaks stand in for all those social misfits who are outcast for their differences. It is no wonder that Freaks was rescued from cinematic oblivion by the counterculture of the ’60s, and has been embraced ever since by those who, for whatever reason, stand apart from mainstream culture and disdain the shallow hypocrisy they see there; the appeal is obvious to anyone who has ever felt shut out because of who or what they are- and which of us can say they’ve never felt that? Freaks, then, is a parable that validates the disenfranchised. It also (to borrow a phrase) comforts the disturbed and disturbs the comfortable, which it’s probably fair to say is what Tod Browning set out to do with his magnum opus. Though it may have cost him his future, I’m sure it would be some consolation for him to know that, even if it did take decades to happen, he is dearly appreciated for having succeeded. Today’s cinema adventure: Lincoln, the long-awaited feature by director Steven Spielberg about the efforts of Abraham Lincoln (and his cabinet) to ensure the passage of a constitutional amendment making slavery illegal in the United States. Starring Daniel Day-Lewis as the 16th American president, with a host of high caliber actors in supporting roles and a screenplay by Angels in America playwright Tony Kushner, it was the culmination of more than ten years of development and production; released in the wake of a divisive election in a polarized nation, its timing has no doubt contributed significantly to the general acclaim it has so far received from both the critics and the public, helping to make it Spielberg’s best-received film in over a decade. Inspired by and partly based on Doris Kearns Goodwin’s book, Team of Rivals: The Political Genius of Abraham Lincoln, the film’s plot confines itself to the last four months of Lincoln’s life, when he undertook to force the passage of the 13th Amendment in the House of Representatives before the end of the Civil War. With the opposition party firmly against the proposed law, and his own side sharply divided, it’s a seemingly uphill battle, and his cabinet, staff, and advisors urge him to wait until the start of the new term, when the congressional numbers will be in his favor; but the savvy Lincoln knows that once the war is ended, support for the cause will diminish. Therefore he sets his administration to the task of securing the necessary votes- by whatever political means necessary- to approve the amendment in congress before the window of opportunity is closed. With his attention focused on this objective, he must also cope with pressures in his private life- the ongoing grief over the death of his middle son, his strained relationship with his eldest son Robert, and the emotional fragility and possible mental instability of his wife Mary. These various situations play out against the backdrop of a volatile and still-rustic Washington D.C., where murky back-room deals, political maneuvering, and ethical compromises are clearly seen to have been as much a daily routine as they are in the modern world. It won’t be giving anything away to say that the amendment passes, in the end; but the road to that political victory is a fascinating and enlightening one, and thanks to Spielberg’s masterful direction and Kushner’s highly intelligent script, the journey keeps us as engaged and invested as if we didn’t know where it was taking us. The film ends, predictably enough, with the death of the president on the morning after he is shot at Ford’s Theatre, but it serves more as a tragic coda than as the culmination of the story- which is less about the man himself than it is about the road to what is arguably his greatest achievement. The fact that Lincoln is an important American film is self-evident (if you’ll pardon the expression). It is the first serious big screen attempt to focus on any part of the great man’s life in over 70 years (since Abe Lincoln in Illinois, a 1940 adaptation of Robert E. Sherwood’s biographical Broadway play of the same name, with Raymond Massey reprising his stage role), and therefore the first film to address the key subject of his abolition of slavery from a post-Civil-Rights-Era perspective; additionally, it focuses on political and social issues with distinct reverberations in the modern U.S., in particular evoking parallels with contemporary congressional partisanship as well as with the currently ongoing struggle towards recognition of equal rights for the gay and lesbian community. The brilliance of Tony Kushner’s screenplay lies in its ability to strike these chords without forcing them on the viewer; he devotes himself entirely to the factual circumstances of his subject, focusing on the historical battle over the passage of abolition and allowing the material to raise present-day associations on its own. He never loses sight of his primary objective, to present a fictionalized representation of historical events, but through the choices he makes about which themes to highlight and which concerns to bring to the forefront, he makes clear the connections between those events and their modern-day counterparts, as well as inviting reflection on the modern state of race relations in America- both how far we’ve come, and how far we have still to go. Likewise, he brings his dramatist’s sense of practical storytelling to the daunting task of painting a portrait of the title character, a towering and near-mythic figure not just in American political history but in the cultural imagination of the entire world; working from contemporaneous accounts of Lincoln, the man, Kushner endeavors to give us a human being instead of a larger-than-life icon, avoiding the temptation to include recreations of famous speeches or historic moments and offering a vision of a man striving to measure up to his role in a larger history of which he is all too aware. We see Lincoln’s confidence, determination, and ethical fiber, but we also see his self-doubt, his insecurity, and his difficulty overcoming the strains on his relationship with his family; if at times he seems idealized, or too good to be true, it is perhaps because our jaded modern sensibilities place his real-life actions outside of our capacity to believe in a man whose motivations seem so noble- but Kushner places strategic curtains over Lincoln’s private feelings, leaving us to speculate whether there is a gap between his personal beliefs and his political convictions, and to ponder his possible struggle to reconcile such differences. In the end, whether idealized or not, the movie’s vision of Lincoln feels like flesh and blood, and if there is any trace of the super-human about him, it lies in his ability to see beyond the personal and short-term needs of the present in order to exert the sheer force of will needed to push the world forward towards a greater ideal. If Kushner’s vision of Lincoln works- and it does- an equal share of credit must go to the actor whose intimidating task it is to play him. There could be no better choice than Daniel Day-Lewis, unquestionably one of the finest actors of his generation, whose ability to completely immerse himself in a role is legendary and whose unwavering dedication to finding the human truth of a character is the one absolutely necessary quality to personifying Lincoln. With it, he is able to maneuver past the pitfalls inherent in playing such a revered figure, concentrating on the immediacy of each moment and capturing the emotional realities that help us reach across a century and a half to connect with a man who exists for most if us only as an exalted image in our cultural consciousness. Day-Lewis plays Lincoln close to the chest, governing his emotions the way a president must, even in his intimate domestic exchanges, but still letting us see the flickers of true feeling as they rise and fall; he inhabits the character so completely that we cannot help but feel we are watching the man himself, even capturing an uncanny physical resemblance to Lincoln seemingly without the use of elaborate make-up. Perhaps best of all, he avoids the trap of dwelling in the iconic leader’s somber aspects, instead making him a charming and delightful personality, undercutting his seriousness with an obvious fondness for spinning yarns and making jokes- even off-color ones. This trait, well-documented and deliberately written into the film, becomes Day-Lewis’ avenue into finding the lightness and the joy in his character, and allows us to like this national hero as much as we respect him. It is a breathtakingly good performance, so much so that we almost forget it is a performance, and the actor himself disappears into the lifelike authenticity if his creation; rest assured, though, Day-Lewis is there, fully invested in yet another consummate performance that is fully worthy of the subject he portrays and making himself a strong contender for a record-breaking third Oscar for Best Leading Actor. Though the film belongs (as it should) squarely to its star, the ensemble cast provides uniformly excellent support; every player breathes absolute life into his or her role, no matter how small, giving the entire film an authenticity as rich as the one provided by the performance at its center, and all deserve equal praise- but there are, of course, a few standouts. Most obviously, by virtue of placement, is Sally Field, another consummate and fiercely honest performer, who is no less fully invested than her co-star, as Mary Todd Lincoln; Field is heartbreakingly real in her portrayal of the high-strung First Lady, still consumed by grief and guilt over the loss of her child, frustrated at the loss of connection in her marriage, and painfully aware- and terrified- of her own precarious mental health. Her scenes with Day-Lewis exude both a desperate tenderness and a palpable ache, heightening the awareness of inevitable tragedy, both past and yet-to-come, that pervades the relationship, but we never get the sense the two have anything less than undying love for each other, no matter what recriminations or conflicts may arise, for better or for worse. The film’s other primary co-star is perhaps more of a surprise; as Thaddeus Stevens, the Radical Republican congressman whose extreme stance on abolition makes him both its greatest champion and its greatest obstacle, Tommy Lee Jones is so eminently watchable he threatens to steal the movie from its star. Bristling with intelligence, humor and passion, armed with a barbed wit and a ready vocabulary, and exuding the masterful, confident presence of a weathered veteran of the political circus, he commands his every scene and catches us unexpectedly at every turn with his thorny blend of effortless bravado and deft understatement; it is Jones, ultimately, that provides the true heart of the film, giving contemporary audiences an access point through his character’s sensibly modern moral viewpoint- which permits him to give voice to some of the movie’s most satisfying dialogue- and thereby bringing home its most emotionally resonant moments through the personal identification we make with him. It’s a sublime performance, every bit as impressive in its way as Day-Lewis’ work, and proof once more that this solid, likable actor deserves perhaps more recognition than he has traditionally received- Academy Award notwithstanding. There are others: David Strathairn as Lincoln’s Secretary of State- and close friend- William Seward, James Spader as rough-edged proto-lobbyist William Bilbo, Joseph Gordon-Levitt as Robert Lincoln, Lee Pace as flamboyant pro-slavery Congressman Fernando Wood, Jackie Earle Haley as Confederate Vice President- and peace emissary- Alexander Stevens, Jared Harris as Ulysses S. Grant, and a fine child performance by Gulliver McGrath as the precocious 12-year-old Tad Lincoln. The list goes on and on, but special mention should be reserved for the great Hal Holbrook (who won an Emmy for playing Lincoln himself, back in the ’70s), adding his own particular brand of dignity to the role of Francis Preston Blair, an elderly and influential statesman- one of the founders of the Republican Party- who agrees to help Lincoln by endorsing the amendment in exchange for being allowed to attempt the brokering of a peace deal with the Confederacy. Aside from its stellar cast, Lincoln benefits from all the blessings that come with being a first-string prestige project. The period costumes and sets are exquisitely executed, with the patina of genuine, lived-in use that makes every frame look like a real historical photo from 1865. This effect is aided by the extensive use of location shooting in several key areas of Virginia, where many historical buildings have been preserved and maintained, and by the muted tones achieved by cinematographer Janusz Kamiński, a long-time Spielberg collaborator; watching the film, one can almost smell the mustiness and imbedded cigar smoke pervading the air. Another familiar Spielberg associate, veteran composer John Williams, provides an appropriately majestic Copland-esque score which conjures an aura of deep-rooted Americana, adding to the sense that we are watching a definitive vision of this chapter of national history. In short, Lincoln is an example of top-notch, A-list production, containing all the exemplary elements necessary to make a fine film, contributed by seasoned professionals and awaiting the sure hand of a master director to assemble them into a finished product. That director, of course, is Steven Spielberg, the one-time wunderkind who is now one of the most powerful and influential filmmakers in the industry, the head of his own entertainment empire, and perhaps the most publicly recognizable face of the Hollywood establishment to which he once seemed to represent the fresh alternative. He has earned that place, without question, with several genuine classics under his belt, from the career-and-genre-defining visceral thrills of Jaws to the iconic adventure of Raiders of the Lost Ark to the haunting humanity of Schindler’s List. No one would deny his supreme gift as a technical filmmaker; he has molded the textbook styles of influences like Ford, Lean and Kurosawa together with the up-to-the-minute edgy techniques of modern cinema to create his own distinctive brand of visual storytelling, and his best work stands with that of the masters from whom he has drawn so much inspiration. However, since his 1982 sci-fi/family film mash-up, E.T., The Extraterrestrial,” there have been many critics and audiences that have noted a tendency towards heavy-handed sentimentality in his work, not to mention a penchant for shaping his films around a personal, socio-political agenda. To be sure, using cinematic trickery to manipulate an audience’s hearts and minds is nothing to be criticized- after all, it is the foundation upon which the art form is based- but it’s a delicate process, and when handled without careful restraint the results can be characterized as disingenuous at best, and as outright propaganda at their worst. It can’t be denied that Spielberg sometimes gives in to the urge to turn the dial one notch too high in his effort to make an emotional point in his films, and from time to time his methods could be described as “a sledgehammer approach.” Even his best films have been occasionally marred by this quality, though in his earlier work, admittedly, it is a tactic that served him well; in his more “serious” projects, however, it has the effect, for some, of undermining the feeling of sincerity. Such a criticism is a matter of taste, of course, but with only a few exceptions, it applies to most of Spielberg’s post-1982 work. Lincoln, happily, is one of those exceptions. As if the deep integrity of his subject demanded the use of restraint, Spielberg pulls back on the emotional throttle, allowing the honest power of the script and the actors to take us where he wants us to go, and using his considerable skills to reinforce rather than to assert. He fills the screen with a rich display of light and shadow, contrasting the somber weight of the 19th-Century environment with delicate and luminous infusions of sunshine and candlelight, using the windows with their lacy curtains to great advantage during interior scenes which evoke the powerful silent film images of such directors as Murnau and Griffith. There are a minimum of scenes depicting the brutal horrors of the Civil War, but these brief episodes are more than sufficient to convey the nightmare that raged beneath Lincoln’s fatal presidency, constructed with the same unflinching, terrifying realism with which the director filled his WWII drama, Saving Private Ryan; and though the majority of the story unfolds through dialogue, he creates a sense of action throughout with his constantly mobile camera, and- with the help of editor Michael Kahn, yet another frequent collaborator- he keeps a tight pace which drives the movie forward and makes it feel shorter than its two-and-a-half-hour running time. Most cinematic of all, he conveys volumes of subtext and a wealth of vital plot information through his masterful visual sense, composing eloquent shots and creating powerful montages that fill in the blanks without the need for gratuitous exposition or unwieldy language. There are a few- just a few- moments when the “Spielberg touch” threatens to emerge; but for the most part, Lincoln is the work of a mature and self-assured director with nothing to prove- a subtle, layered, and thoughtful meditation on history, politics, and morality that never insults its audience by forcing a perspective. There are those, undoubtedly, that will object to Lincoln for reasons of their own- personal politics, a revisionist view of history, an iconoclastic desire to deconstruct this mythic hero and expose his less attractive qualities. If you are looking for a film that treats Abe Lincoln as anything less than a national saint, you will not find it in Spielberg’s opus. 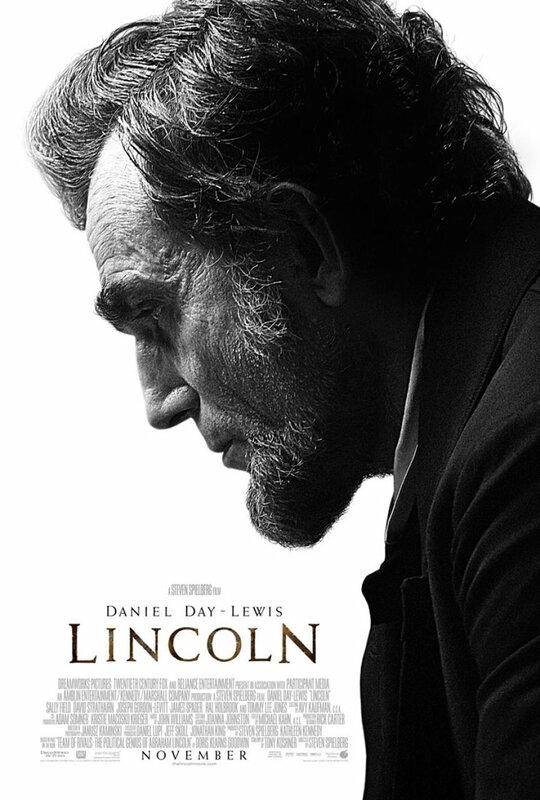 Such a film might well have its place, and personally, I would be very interested in seeing it, but Lincoln, ultimately, is as respectful a portrait of the man as you are likely to find, despite its concerted- and largely successful- effort to humanize him. This does not, however, mean it is somehow sugar-coated, or less than truthful; nor is it one of those “Important” Hollywood epics that reeks of smug self-satisfaction in its pious pretentiousness. I must confess, this latter quality is what I fully expected, though I also anticipated a transcendent performance from Daniel Day-Lewis; instead, I got the pleasant surprise of experiencing a piece of elegant filmmaking that is as honest and heartfelt as it is significant- a rarity in today’s high-stakes movie industry, to say the least. 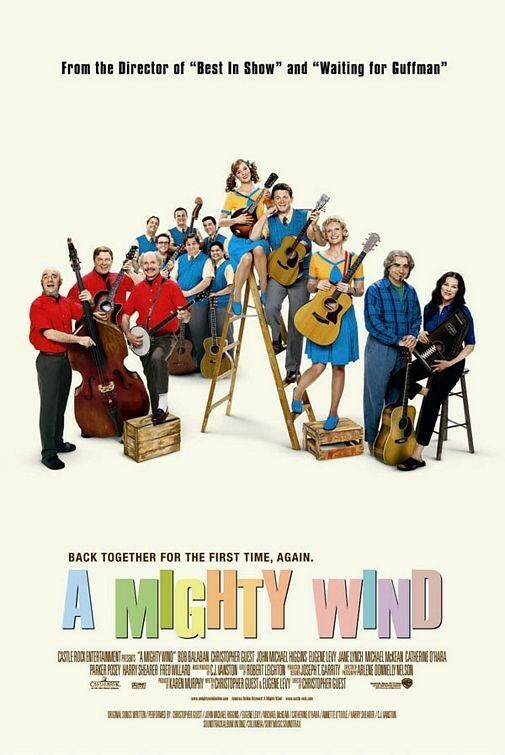 Though it may not be the greatest film ever made about American history, or even be Spielberg’s greatest film, it is a far better film than most people likely expected it to be; more importantly, it offers a cultural touchstone, a sort of celluloid monument at which we may pause to reflect upon our national identity- to which this president certainly contributed an enormous share in shaping- and connect with each other through its portrayal of a man whose achievements stand to validate our belief in the very best qualities within us all. Today’s cinema adventure: Cinderella, Walt Disney’s 1950 animated adaptation of the classic folk tale immortalized by 17th-Century author Charles Perrault, a simple tale about a young orphaned girl, forced to work as a menial servant by her vain stepmother and stepsisters, who is granted a wish to attend a royal ball where her sweet nature and her beauty win her the heart of a handsome prince. The first fully animated feature produced by the Disney Studio after World War II, it was something of a gamble, an expensive undertaking which would have likely resulted in bankruptcy had it failed to attract an audience; it did not fail, however, instead becoming an overwhelming success which provided the financial base for the expansion of the Disney company during the 1950s, paving the way not only for more features, but for the establishment of their television division and the beginnings of their theme park empire. It remains one of their most enduring titles, commonly ranking near the top on lists of the greatest animated films of all time and continuing to enchant viewers of all ages as it inspires new generations of would-be princesses to believe in their dreams. The basic plot of Cinderella dates back to ancient times, and can be found in folklore from a wide range of cultures and eras. One version even found its way into Shakespeare’s King Lear, albeit with a tragic twist, through the story of the mythic Princess Cordelia, who not only marries her dream prince but defeats her cruel and ambitious sisters with his army; another dark variation on the tale can be found in the stories of the Brothers Grimm, who included such details as the stepsisters cutting off portions of their feet and their being blinded by attacking birds. The most familiar version today, however, arises from Perrault’s story, which added the iconic elements now indelibly associated with it, including the fairy godmother and the magic pumpkin coach; Disney’s artistic team used this as their source, eliminating some of the darker aspects and placing a heavy emphasis on the peripheral adventures of the heroine’s animal allies, which are played for child-pleasing comic effect. Indeed, the main events of the plot comprise relatively little screen time, and the story is largely told through the behind-the-scenes perspective of the mice, whose machinations are largely responsible for Cinderella’s eventual triumph. 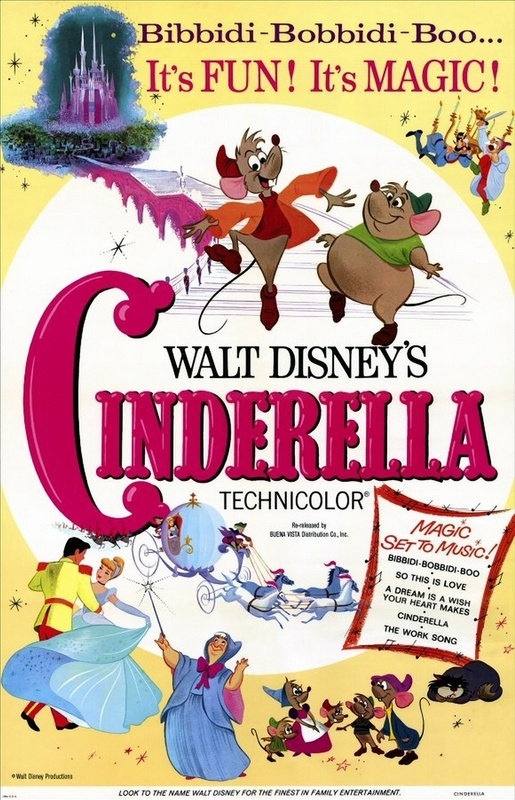 The film opens with a narrated prologue in which the tale’s background is set; Cinderella is the daughter of a widowed aristocrat who takes a second wife with two daughters of her own, hoping to provide his child with a motherly influence, but upon his premature demise this new stepmother becomes a domineering tyrant, forcing Cinderella to live the life of a servant while doting on her own vain and mean-spirited girls. Despite her lowly existence, Cinderella grows into a lovely and sweet-natured young woman, befriending the animals of the household, including the mice and birds, and treating them all with kindness- even her stepmother’s spoiled and vindictive cat, appropriately named Lucifer. One day, an proclamation arrives from the palace that all eligible young ladies in the kingdom are invited to a royal ball in honor of the Prince, whom the King hopes will choose a bride from among them; Cinderella hopes to attend along with her stepsisters, but their scheming and jealous mother burdens the girl with extra chores in order to prevent her having the time to prepare a suitable dress. Her loyal animal friends manage to make a lovely gown from the cast-off scraps of the stepsisters’ wardrobes, but when the elated Cinderella rushes to join her family as they prepare to depart, the two selfish girls accuse her of theft, and rip the borrowed items from her dress, leaving her in tatters as they head off to the palace. Her tears of despair quickly disappear, however, when a kindly old woman materializes, proclaiming that she is Cinderella’s fairy godmother; she promptly transforms a pumpkin into an elegant coach and the girl’s torn dress into a sumptuous gown, and sends her off to the ball- admonishing her, however, that she must return before midnight, when the spell will be broken and all her magical accoutrements will return to their original, non-enchanted form. At the palace, the young Prince is bored and unimpressed by the procession of bachelorettes vying for his hand- that is, until the late arrival of a mysterious beauty, to whom he is immediately drawn. They waltz together and wander the palace grounds- until the clock begins to strike midnight, when she hastily flees, leaving behind no clue to her identity except a single glass slipper, lost on the palace steps in her hurry to escape before the final chime can break the spell and reveal her lowly state. Determined to find the mystery girl who has won his son’s heart, the King declares that the slipper will be tried on the foot of every maiden in the kingdom until a match is found, but Cinderella’s destiny may still be jeopardized by the efforts of her malicious stepmother, who is bent on seizing this last chance to secure a royal marriage for one of her own unpleasant children. With time running out, it will be up to the heroine’s animal friends to come to the rescue and ensure that her “happily ever after” dreams will at last come true. As with all of Disney’s early productions, the screenwriting and directing duties on Cinderella were handled by multiple individuals, working in concert under the tight supervision of Walt himself and in close collaboration with the chief animators. It is a testament to the strength of Disney’s vision that these films emerged as cohesive works of art, blending the styles and influences of their various contributors together into a unified whole. At the time of Cinderella, the studio had spent several years languishing under the budgetary constraints of wartime, when their output had been limited to the obligatory shorts- still popular, but eclipsed by the success of Warner Brothers’ edgier Looney Toons and Merrie Melodies cartoons- and omnibus features which packaged several of them together or mixed short animated segments with live action footage. Though the great features of the pre-war era had earned them much acclaim and a formidable reputation, only the first of them- Snow White and the Seven Dwarfs– had been a bona fide hit, and full-length animation was too risky to warrant the considerable expense required for its production during the wartime economy; even so, the studio had honed its skills during these lean years, particularly in its recognition of the importance of music as a means to generate interest- and additional income- for their films. Disney’s return to the field of feature-length animation was therefore bolstered by a deliberate effort to create songs which could not only add to the movie’s appeal, but which could become an asset in their own right, and Walt enlisted three established popular songwriters- Mack David, Jerry Livingston, and Al Hoffman- to compose tunes which could also be marketed on their own through the studio’s music division (the song rights for the previous films had been sold to other music publishers). Even with this hedging of its bets, Disney was taking a major risk with Cinderella, releasing a family-oriented fairy tale into a market dominated by the grittier, world-weary cynicism and social commentary that had grown prevalent in post-war American films; but, whether by instinct, luck, or savvy foresight, Walt’s return to the medium which made him famous came at precisely the right time, heralding a revival of optimism and a growing taste for glossy fantasy that would mark the new and prosperous decade. Watching Cinderella today, it’s remarkable to see the seeds of Eisenhower-era sensibility so clearly visible in its framework. The “American Dream” is here encapsulated by the movie’s story of success earned by hard work and a positive attitude, and its focus on the feminine perspective emphasizes the role of women in that objectified way of life- namely, to strive for fulfillment through the ultimate life accomplishment of marriage to a successful man. Cinderella, after all, is trained from the outset to be a devoted wife, with a deep attachment to her father and years of experience tending to every household chore; and her fitness as a mother is plainly seen in her nurturing relationship with her animal friends- particularly the two foremost mice, Jaq and Gus, who are more or less characterized as children in animal form. Of course, the importance of beauty is also stressed, most strongly in the significance of Cinderella’s ball attire, with both the simple-but-charming dress constructed by the animals and the sumptuously dazzling gown into which it is magically transformed being afforded considerable weight in the film’s plotline. Throughout the movie, even in the animal subplots, traditional gender roles are subtly reinforced, and the principal male characters- the human ones, anyway- are firmly established as the natural beneficiaries of masculine privilege, a status heightened by their identification as royalty in the hierarchy of the story. On top of all these social foreshadowings, the visual design of the film is replete with precursors to 1950s fashion, from the rich color palette, to the lines of the clothing, to the predominance of old-fashioned Euro-elegance in the settings and decor. As a final touch, the lush and dreamy music, at once catchy and soothing, fits directly into the mold of the popular songs that would dominate the sound of the coming decade- until the advent of Elvis and his rock-and-rolling ilk, that is. In short, Cinderella, in the clarity of hindsight, looks very much like a blueprint for life in the ’50s, and one which may have had more influence on the shape of that decade than its creators had ever envisioned. Aside from these signposts of its place in the timeline of cultural history, Cinderella also offers a look at the state of its art form at the time. Despite Warner’s’ dominance in the realm of popular cartoons, Disney was still the undisputed master of the genre; nobody else could do the things they were doing, and their drive to continually advance the art was still strong, perhaps even more so after years of being held back by the war. Even so, the creative juices flowing through Cinderella seem flavored less by the hunger of young visionaries than by the confidence of mature artists; there is an obvious delight in their work here, a feeling of seasoned professionalism taking enjoyment in showing off a hard-earned mastery. There is also a softening in tone, a gentleness which marks a shift from the more heightened drama of such films as Pinocchio and Bambi to an easier-going sensibility more in keeping with the middle-of-the-road values the studio would come to represent over the coming decades. This is not to say that Cinderella is devoid of drama or suspense; on the contrary, it takes full advantage of its creators’ cinematic skills in order to increase the tension in a story which is, to be quite frank, lacking in the type of high-stakes conflict found in the studio’s earlier classics- extreme perspectives, rapid editing, heavy use of light and shadow, and all the other tricks of the trade with which these animated filmmakers not only enhanced their storytelling, but which were imitated by live-action directors and thereby bore significant influence on the future development of cinema in general. Even so, it is undeniable that Cinderella is more calculated, for want of a better word, in the sense that it makes a deliberate effort to evoke reactions to its narrative, rather than allowing its form to be a direct expression of the needs of the story itself. This is, perhaps, an intangible distinction, and one which arises more from the nature of the story being told than a change in the attitudes of the artists, but it is a noticeable factor in the ongoing development of the Disney animation machine, and one which would later result in what many critics would characterize as a decline in the immediacy and relevance of their work. None of those later criticisms apply, however, to Cinderella; it’s a fresh and heartfelt piece of entertainment, and whatever subliminal social agenda might be read into it by progressive modern thinkers, it transcends such retro-fitted concerns with its imaginative approach to a timeless story. Sweet without being sugar-coated, funny without undermining its deeper themes, and stylish without being shallow, it is a fine representative of Disney at its magical best. It goes without saying that the animation is stunningly executed; in their quest to infuse the film with a high level of reality, the animators turned once more to their technique of utilizing live action footage as a guide, filming a heavy percentage of the movie with real costumed actors and models in order to give themselves a reference from which to capture the illusion of real movement and expression. This was not accomplished through rotoscoping- the actual frame-by-frame tracing of live footage- but by free-hand drawing to recreate the filmed sequences, a painstaking process, but one which affords a considerable amount of leeway for artistic interpretation. In this way, the Disney artists seamlessly blend the realistic style of their human characters with the more overtly cartoonish animals, bridging the two worlds with the intermediate characterization of such comic figures as the King and the Stepsisters. It’s a fully realized world, enhanced further by the magnificent work of the background artists and the conceptual designers. I am not one to belittle the advances in technology which have given us the remarkable computer-generated wonders seen in today’s movie houses, but when confronted with the sheer beauty of a film like Cinderella, made all the more dazzling by the intangible influence of the direct human touch, it is difficult not to lament the all-but-lost art of hand-drawn animation. The visual artistry here, as usual with a Disney production of this nature, is in the service of a story that, for all its simplicity and kid-friendly humor, strikes deep chords in the hands of these gifted artists. Though contemporary audiences may quibble about the story’s pre-feminist underpinnings, Cinderella‘s message is not simply a reinforcement of the traditional belief that a woman’s place is in the home with a man to take care of her; rather, the emphasis is placed on the theme of believing in yourself and having faith in your dreams. Likewise, though outward appearance is clearly a factor in the fantasy being portrayed- Cinderella must be lovely, after all, and the Prince must be handsome, just as the stepsisters cannot be anything but homely- it is not these surface qualities that are central to the plot; it is Cinderella’s kindness and good nature that make her deserving not only of our sympathies, but of the fierce loyalty of her animal friends and the help of her fairy godmother, and it is the selfishness and jealous vanity of her two stepsisters that make them truly ugly. Disney knew what he was doing, too; Walt himself made cuts to the screenplay in order to remove episodes that implied less attractive qualities in his heroine, and great care was taken to ensure that her happy ending hinged not on her pretty face, but on the positive effects of her inner beauty. Finally, the brightness of the slick romantic fantasy is countered by the palpably dismal atmosphere surrounding Cinderella’s family life; despite the extensive humor provided by the mice and the comic exaggeration of the stepsisters’ unpleasant personalities, the film makes clear the grim reality of its heroine’s existence, making the best of a miserable situation in which she is treated, essentially, as a slave and a prisoner, and victimized by the severe psychological abuse of her menacing stepmother- whose cold and calculated cruelty is no less horrific for the certainty that she will, in the end, fail to prevent her ward from finding happiness. As previously observed, Cinderella is the result of extensive collaboration, and there is little point in reciting a list of names here; the names of the directors, writers, supervising animators and designers, all of whom deserve praise for their work, can easily be found on any number of other websites. A few individuals, however, deserve to be singled out for their particularly notable contributions. Perhaps most significant of these is Mary Blair, credited as “color stylist,” whose concept art featured a distinct array of primary hues but went beyond the creation of a color palette to infuse the entire film with her own subtly whimsical-but-elegant visual style; her work on this and subsequent Disney projects- including the creation of Disneyland- helped to define and influence the familiar “look” of much of the studio’s output throughout the next two decades. Also important is the voice work done by a talented cast of Disney stalwarts, particularly Ilene Woods (as Cinderella)- who landed the role after friends recorded her singing voice and sent the tape to Disney without her knowing, and who ended up also modeling the character in the live action reference footage, a duty she would later repeat for other Disney heroines- and Eleanor Audley (as the Stepmother), whose chillingly austere vocal talents would be used again in another iconic villain role- the evil Maleficent in Sleeping Beauty– and in Disneyland’s “Haunted Mansion” attraction. Lastly, the aforementioned trio of songsmiths provide one of Disney’s most memorable and popular scores, which includes at least two songs that would become signature tunes for the studio (“A Dream is a Wish Your Heart Makes” and the Oscar-nominated nonsense tune, “Bibbidi-Bobbidi-Boo”), and which yielded a number of successful recordings by popular singers of the era. I must confess that though I am, perhaps obviously, an unrepentant fan of Disney movies (at least, of their canon of classic animated features), Cinderella has never been a particular favorite of mine. Perhaps it is that my own taste runs towards the darker, more dramatic flavor of the studios original array of classics, or that the “princess” theme doesn’t have a strong appeal for me. Even so, I am quick to acknowledge the superb artistry behind it; every frame is rich with the kind of imaginative detail that infuses the movie with a life of its own and separates a Disney film from the pedestrian efforts of lesser producers. It contains many of the studio’s most beloved and iconic sequences, such as the architectural construction of Cinderella’s would-be party dress by the determined crew of mice and birds, the architectural construction of the fairy godmother’s magical creation of the coach and gown, the lovely scene in which a scrubbing Cinderella sings harmonies with herself while reflected in floating soap bubbles, and the ethereal beauty of her rendezvous with Prince Charming (who is, incidentally, never referred to by that name- nor any other, for that matter). The character animation is superb, bringing to life one of Disney’s most disturbing villains in the Stepmother- a completely human monster who is more terrifying than many of the supernatural antagonists created for the studio’s other films- as well as the delightfully engaging mice, Jaq and Gus, and their nemesis, Lucifer the cat, whose ongoing conflict provides much of the film’s real action as well as its comedy. Lucifer, in particular, is a marvelous creation, with an instantly recognizable feline personality and just the right balance of menace and silliness to make him both a tangible threat and a buffoonish foil for the antics of his rodent quarries. All in all, there is a lot to love about Cinderella, a radiant and charming piece of filmmaking with its heart in the right place, no matter what accusations may be leveled by modern-day social critics; even if, in the end, I can’t say it places as highly on my personal “best of animation” list as it does on so many others, I still recommend it heartily, without reservation, as a fine example of Disney artistry in its prime. In the end, or course, my opinion- or that of any other critic- is irrelevant; Cinderella is a classic, destined to remain with us for a long time to come. After all, it has appealed to generations of children- and quite a few grown-ups- as strongly as it did upon its first release, over a half-century ago, and all those little princesses certainly couldn’t be wrong. If any of you cinema freaks are in the Los Angeles area or will be between now and June 30, 2013, you owe it to yourself to visit the Los Angeles County Museum of Art (LACMA), where an exhibition celebrating the work of director Stanley Kubrick is currently on display. An elaborate collection of artifacts from and related to the legendary filmmaker’s magnificent movie projects is on hand, including iconic props and costumes, shooting scripts, production photos, letters and documents, news clippings, and models, as well as work from Kubrick’s early career as a staff photographer for “Look” Magazine. Of course, there are also numerous video screens featuring memorable clips from the films themselves, concept art, analysis of musical choices, and more. A die-hard movie buff could spend hours perusing the wealth of material here, but even the casual fan will find plenty to induce the chill that comes from standing in the presence of greatness. Tickets are $20, which includes full access to the rest of the museum’s impressive collection of treasures- including, until February 10, an exhibition celebrating the work of late-Renaissance bad-boy Caravaggio and his influence over the artists of the following generation. It’s a great outing for a day of culture, cinematic and otherwise- I should know because I went yesterday. 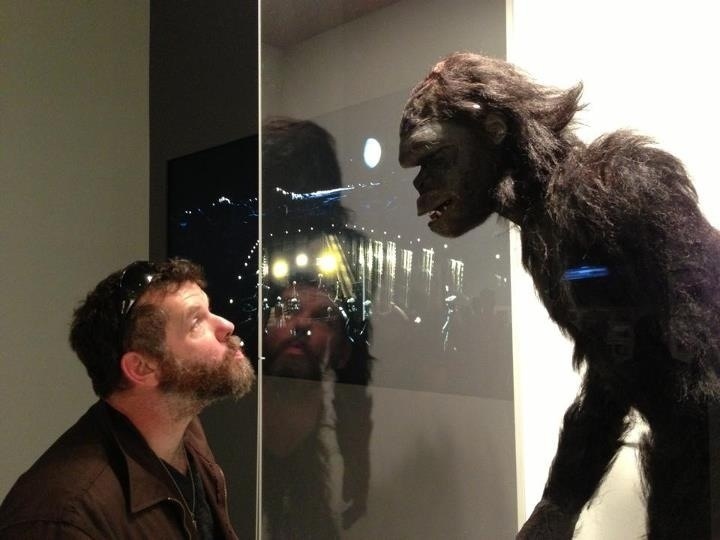 Below is a link to buy tickets and a candid shot of yours truly with one of the prehistoric ape-men from 2001: A Space Odyssey, just to prove I was there! 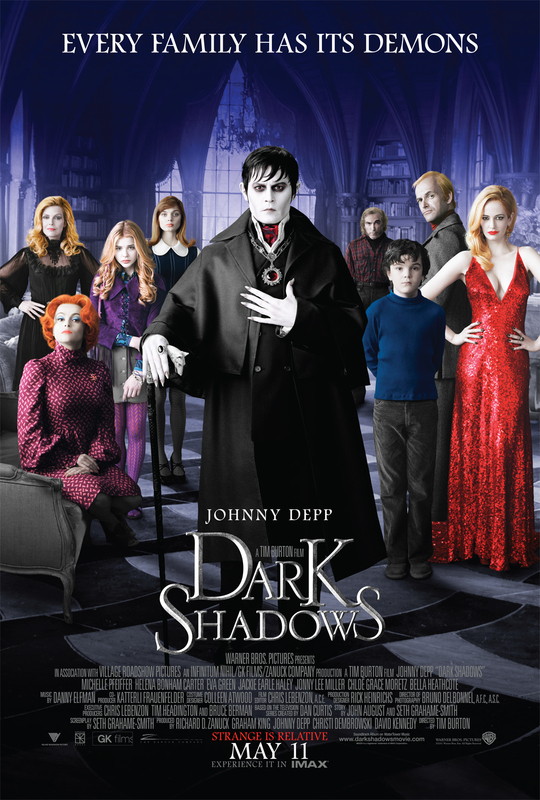 Today’s cinema adventure: Dark Shadows, the 2012 big screen adaptation of the classic 1960s supernatural soap opera of the same name, directed by Tim Burton and starring a gallery of players comprised of both frequent collaborators (most notably, of course, Johnny Depp) and high-profile new faces. Taking its basic premise and most of its characters from the original series- a low-budget affair, created by Dan Curtis, with an enormous cult following which thrives to this day- Burton’s film capitalizes and expands on its camp value, and uses it as a vehicle with which to blend his own trademark sense of macabre humor into a nostalgic revisitation of the early ’70s era in which it is set and a tribute to the gothic horror cinema with which he grew up. Long-awaited and much-anticipated, its box-office take was respectable despite the impact felt from direct competition with The Avengers, but it met with disappointed reactions from critics and audiences alike, despite its high production values and the popularity of its director and his quirky leading man. Though using the television original as a source for its basic scenario, the screenplay (penned by Seth Grahame-Smith from a story developed with John August) veers from the details of its episodic plot in favor of a more-or-less self-contained storyline, making several significant changes in the process. The film begins with a prologue in which the background is laid for the ensuing events; in 1760, the wealthy Collins family emigrates to America, expanding their commercial fishing empire to the coast of Maine and building a majestic estate surrounded by a thriving seaport town- named Collinsport in their honor. However, the family’s young scion, Barnabas, runs afoul of a household servant, Angelique, by spurning her after a brief dalliance; secretly a witch, the jilted girl avenges herself by cursing the Collins family, killing Barnabas’ parents, bewitching his fiancée to suicide, and transforming him into a vampire. She then exposes him to the town as a monster and persuades them to bury him alive, dooming him to endure a solitary eternity with the memory of his loss. The story then flashes forward to 1972; the town of Collinsport still thrives, now sustained by a rival fishing empire founded by none other than Angelique, who has used witchcraft to sustain her own immortality. The Collins estate still stands, inhabited by the family’s last dysfunctional descendants: Elizabeth Stoddard, the stern but determined matriarch; her sullen teen-aged daughter, Carolyn; her ne’er-do-well widower brother Roger Collins; and his troubled young son, David, who insists he can see and talk to the ghost of his recently-drowned mother. Rounding out the household are two heavy-drinking outsiders- the boy’s live-in psychiatrist, Dr. Julia Hoffman, and caretaker Willie Loomis- as well as a newly-hired nanny, Victoria Winters, who has a secret past. These last remnants of the once great Collins brood are surprised by the sudden arrival of Barnabas, inadvertently freed from his two-century imprisonment by the excavations of a construction crew. Despite his monstrous nature, he is still devoted to his beloved family, and vows to help them rebuild their collapsed fortunes and restore the Collins name to its former glory. In order to succeed, however, he must once again confront the vindictive and powerful Angelique, who still carries a torch for him after all these years, not to mention helping his descendants work through their various dysfunctions while keeping the secret of his vampiric identity and continually trying to come to grips with life in the 20th Century. To complicate his task further, he finds himself drawn to the lovely Victoria, who stirs in him the memories of his long-lost love. It might seem, all things considered, that Dark Shadows would be a perfect match for the unique sensibilities of Tim Burton; the director has built an empire of sorts on his peculiar brand of gothic-flavored pop cinema, drawing heavily on influences from past masters of horror while infusing these macabre elements with a distinctively contemporary flair for irony and dark humor. His visual style mixes the grotesque with the endearing and the arcane with the hip in a way that has become instantaneously recognizable as his own, and his recurring motifs (the focus on abused, disenfranchised characters and their efforts to redress the wrongs they have endured, as well as their need to find emotional connection and the innate humanity often hidden by their outward appearance or outcast status) weave their way through his body of work in a way that further marks him as a true auteur. He has a way of using his horrific subject matter to express basic and universal emotional values, transforming that which at first seems disturbing into something almost sweet; he has created a niche for himself as a cinematic champion for the social outsider, making movies that invert the formulas of traditional romance and adventure and carry the decidedly life-affirming message that freaks are people too. With such a background, Burton would appear the perfect candidate for bringing the campy chills of Dark Shadows to life for a new generation, and infusing it with an added layer or two of contemporary perspective in the process. Unfortunately, the rich potential inherent in this match-up goes largely unfulfilled. Perhaps the key element in the popularity of Dark Shadows in its original incarnation was its unflinching determination to take itself seriously despite the obviously ridiculous underpinnings of its premise, the banal soap-opera dialogue that often sounded like it was written over the course of a ten-minute coffee break, and the low-budget constraints on its efforts at gothic ambiance; it was never high art, but rather a guilty pleasure. With Burton’s blockbuster approach, these charms have been subverted: the stone walls of this Collinswood never shake when a door is slammed; and instead of bold-facing its way through discussions of ancient supernatural forces with a deliberate lack of irony, the film treats the entire scenario as fodder for self-aware tomfoolery. It’s understandable, even wise, that Burton and his team would take this approach; to recreate the intangible air of somber goofiness that marked the original series would likely be impossible by deliberate effort, particularly in the more sophisticated cultural environment of 2012. The problem is that somehow, despite the impressively crafted visuals and the considerable talent of its star-powered cast, Burton’s film seems sillier and, well, much more pointless than it should. Though some effort was made to recreate the soapy format, at least in the dialogue-driven scenes, and in spite of the obvious reverence in which Burton et al. hold their source material, this effort to bring Barnabas Collins and his broken clan into the flashy present feels bogged down by an inability to mesh the heavily comic reinterpretation into a compelling story; the thematic elements on which the plot is based seem all-too-familiar (especially for Burton) and the key story developments seem perfunctory, as though the script were put together strictly by formula- which, of course, it probably was. In the absence of any real weight in the narrative, all that remains are character development- sadly botched by the script’s cartoonish approach, which gives us caricatures drawn with broad strokes (despite the solid work of the actors) and leaves us confounded by their actions, which seem motivated by the needs of the plot rather than based on any semblance of inner logic- and the heavy reliance on comedy, mostly derived from the juxtaposition of an 18th-Century dandy into 1970s culture, as well as the nostalgic kitsch that comes from the recreation of this 40-year-bygone era. Dark Shadows is full of jokes, but since the majority of them are centered on Barnabas’ culture shock and inability to adapt his mindset to the modern world, it feels like the same one, endlessly repeated. This is not to say there are no laughs here- at times the magic formula does work- but they are few and farther between as the film moves towards its predictably spectacular finale. Similarly, the gothic creepiness which is so integral a part of the world of Dark Shadows– both here and in its former life- is layered on with all the expected excess and Burton-esque flair, but no matter how many visual nods are thrown in the direction of the Hammer horror classics, the whole atmosphere more closely resembles the tongue-in-cheek faux-spookiness of Disney’s Haunted Mansion. In other words, a contemporary reboot of this franchise could have been either funnier or scarier than the original, or better yet, both; but this film is neither. To the director’s credit, although much of the film falls flat, it never seems to be disingenuous; though screenwriter Grahame-Smith’s efforts may lack sincerity, Burton’s translation of them to the screen does not. Unfortunately, his good intentions are not enough to make Dark Shadows into the movie it deserves to be. That said, it should be observed that there is plenty of exemplary work on display here. Even the critics who were harshest with Dark Shadows were lavish in their praise for its visual style, drenched with Burton’s usual synthesis of Grand-Guignol-goth and candy-coated pop art. He has gotten so good at creating this kind of pseudo-horrific spectacle that it no longer thrills or delights us with quite the morbid wonder evoked by Beetlejuice or Sleepy Hollow, despite the added polish that has come with an increased budget and the advancement of CG technology. Indeed, one almost takes it for granted in Dark Shadows, which is a mistake the savvy viewer should avoid; the intricate and imaginative design and execution of the Collinses world is the one unqualified delight of the film, and the recreation of the early ’70s setting which is woven into the gothic visual tapestry adds an extra layer of flavor- and one which manages to be heavily definitive without resorting to over-the-top parody. Aiding in this sense of heightened authenticity is the saturated cinematography by Bruno Delbonnel, who based his work, to great advantage, on the look of actual films of the era. As for the cast, it has already been mentioned that they do exemplary work, despite the weakness of the material. There are standouts among them: Michelle Pfeiffer, who comes closest to recreating the style of the original series as Elizabeth, underplaying her melodramatic dialogue like the pro that she is; Chloë Grace Moretz, a young actress with a remarkably mature talent that appears to be propelling her into the status of bona fuse stardom, as the snarlingly rebellious Carolyn; and Jackie Earle Haley, as Willie the Caretaker, whose unfazed, deadpan persona adds a much-needed earthiness to the proceedings. The others are less memorable, even the beautiful Eva Green (as the venomous Angelique), simply because their roles require little of them beyond the one-dimensional functions they are assigned by the screenplay, but to their credit, none of them come off badly for it. There are a few interesting cameos, as well; iconic horror star Christopher Lee makes another Burton appearance as a salty old sea dog; seminal shock-rocker Alice Cooper plays himself, hired to perform at an elegant ball thrown by Barnabas and looking agelessly like his own four-decade-old persona; and as guests at the same ball, original Dark Shadows cast members Lara Parker, David Selby, Kathryn Leigh Scott and Jonathan Frid- the original Barnabas, who would, sadly, pass away shortly before the film’s release- pay a fleeting visit, being greeted at the door by a beaming Johnny Depp. And what of Mr. Depp himself? This charismatic screen chameleon has acquitted himself admirably in no less than 8 films with Burton, indeed becoming virtually the face of the director’s work, as much a part of his milieu as the sinister subject matter; in these appearances, as with most of his other work, he has displayed a gift for making the offbeat quirks of his characters into utterly convincing extensions of his natural personality, using imagination, intelligence and honesty to give these oft-cartoonish figures an unmistakable ring of truth. Popularity notwithstanding, he is a vastly underrated actor, capable of remarkable range, who augments and enhances virtually any film in which he participates. His performance as Barnabas Collins, though it certainly lives up to his usual standards, is a bit of a letdown. It’s not that he is any less committed than usual- indeed, he exhibits a clear relish for the part, no doubt a result of his long-standing wish to play it- but that, once more, the script falls short of the mark. Though Depp infuses his over-the-top mugging with his customary connection to truth, allowing us to believe in this unlikely character as more than a cipher in an extended skit and even making him likable enough to care about his ultimate fate, his Barnabas is ultimately a hollow spectacle, an exercise in comic acting that lacks a solid core; he plays the character to a tee, but in the end, thanks to the formulaic writing, he has made no inner journey. He, like all the other characters, has simply reacted to each plot development without growth or change, which makes our wish for his ultimate success more of a reflex in response to the conventions of the narrative than a result of any real connection to the character. It might be argued that this is the nature of true melodrama, which concerns itself with outward events rather than inner truth, and is therefore apropos for a film that is, after all, based on a soap opera; nevertheless, it hardly allows for a truly engaging experience, resulting instead in an entertaining but noticeably shallow diversion that seems to drag on interminably despite a relatively short running time. Depp’s performance, as the centerpiece of the film, is just the clearest representation of the singular flaw that prevents Dark Shadows from ever truly drawing us in: a lack of any real purpose to propel it forward, making it feel, in the end, like an overlong pageant instead of an engaging story. I wanted to like Dark Shadows. I wanted to very badly, and I had high hopes for it because Tim Burton is, for my money, a truly great filmmaker; his work has an audaciously subversive glee that makes even his most commercial projects feel edgy, and even if many of his biggest films are ultimately less than the sum of their parts, he has an impressive track record that will surely leave him, in the final analysis, standing firmly in the pantheon of cinematic masters. That said, his very best work seems to occur when he veers away from his most characteristic material, in films such as Pee-Wee’s Big Adventure, Ed Wood, Big Fish, and Sweeney Todd, the Demon Barber of Fleet Street, flavored with his particular style but ultimately informed by another sensibility and governed by a different set of rules. Dark Shadows, though it was originally spawned by another mind than his own, is nevertheless a quintessentially Tim Burton film, and bears his own unmistakable stamp. It’s not a bad movie, by any means; it’s at least moderately entertaining, though unlikely to elicit any strong reactions of either fear or laughter, and it is certainly good-natured enough to be forgiven for not quite living up to its potential. What is troublesome about Dark Shadows is that it could have been great- should have been, even- but it was defeated before a single frame was captured on film. No matter how talented its director, how masterful the designers and artists who bring it to the screen, or how brilliant its players, a movie with a mediocre script will never be better than a mediocre movie. This is, of course, a problem as old as movies themselves- countless would-be classics have been sunk by incompetent writing- but it is particularly upsetting when artists of this caliber fall prey to the trap. Both Burton and Depp pursued this project, and it was a labor of love for them from beginning to end- how then, could it go so wrong? Perhaps it was, after all, their affection for the material that tripped them up, blinding them to the faults of their film with false confidence in the notion that such a seemingly natural match of artists with their material could not help but succeed. Whatever the reason, it was an artistic miscalculation, for Dark Shadows is probably the pair’s most easily forgettable joint effort, and Burton’s least effective film since his abysmal remake of The Planet of the Apes. From a financial standpoint, however, despite its less-than-hoped-for success at the box office, the sure-fire formula still netted both men- and the studio- a considerable amount of money, leading to the most disturbing suspicion of all- that Hollywood greed overrode artistic aspiration, as it so often does in the film industry, denying us all the joys of the Dark Shadows movie that might have been.